For the past month or two, I’ve been working with my friend Jason on a redesigned website for his brainchild/graphic design LLC, Bright Bright Great. I’m proud to say the site is officially live today, go check it out at BrightBrightGreat.com! Jason’s a great designer, and he’s provided me with a steady stream of freelance coding work, for which I’m eternally grateful. We’re a pretty rockstar duo, so if you’ve got a project that needs designing or coding, please drop me or Jason an e-mail or tweet. A side note: My cross-browser testing cycle has been significantly streamlined lately, thanks to my switch to Mac hardware this past year, VMWare Fusion, and Xenocode’s browser virtual machines. I’d implore anyone who has trouble with this annoying but necessary part of web development to give this workflow a shot. 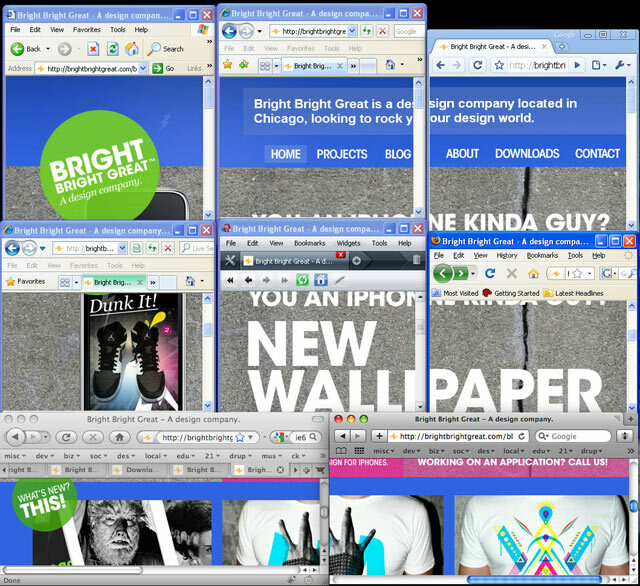 Here’s my post-X-testing screenshot, showing IE6, 7, 8, Opera, Chrome, Safari, and FF Mac/Win. Cool! Bright Bright Great looks killer. I am jello Keep up the stellar designs!